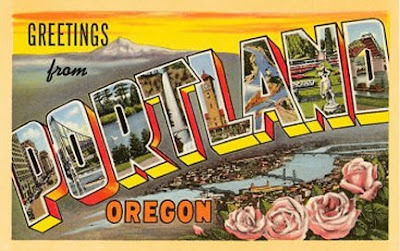 I’m headed to Portland, OR today to make Pretty Little Things with Sally Jean. Or, since I’m in the halloween mood, maybe a few spooky little things too! 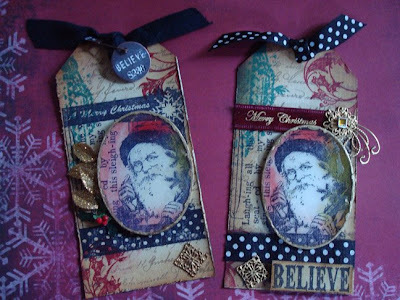 Well, I just couldn't stop making those little ATCs, so I ended up making ten of them. 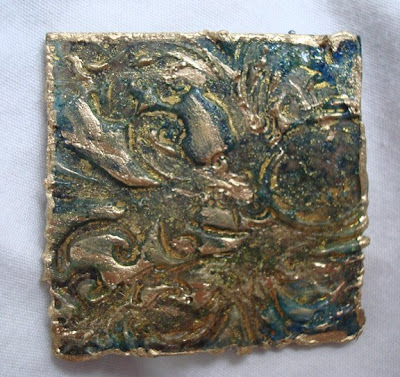 And each and every one of the ATCs has a charm on it from ACharmingPlace. I colored some of the charms with black ink and there's an arrow in there that I colored a purplish color using Primary Elements. One of my favorites is the "Boo-tiful Ghosts" ATC. On the middle and right ghost, I cut this filigree charm in half, bent it a little, and turned it into a "crown" for the ghosts. For the ghost on the left, I cut the sides off this flourish charm and used it for a crown too. Since I missed joining the swap, I've decided I am going to use the ATCs as embellishments in a Halloween book I am going to make. I even went to Scrapbook U today and bought some new halloween papers for the book. Now all I have to do is make it! Apparently, Raquel has been watching my blog (there’s one more for your name count Raquel) and told me one day that "Joy" always comments on my blog. I told her, "Yes, Joy is a sweetheart." Whenever I go to Joy’s blog, I always leave a comment on her blog too. But the truth is, I too look at blogs and rarely comment on them. So it is really nice when someone tells me they saw "such and such" on my blog. It let’s me know someone is out there reading this thing. Last week, one of my friends told me that she saw my dragonfly ATCs on my blog, and that one of them had that special word that she likes so I decided to make one for her too. So tonight, I took out my Primary Elements, my transparencies, glitter and my dragonfly stamp and got ready to make those little dragonflies. Well, I went to squeeze out just a tiny little bit of the medium, but instead a WHOLE bunch came bursting out onto my craft sheet - oops! What a waste! 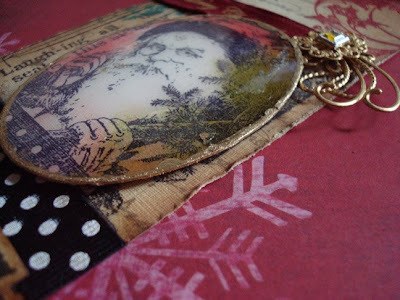 I almost wiped it up with a papertowel to throw away, but instead decided to just throw a bunch of the primary elements into it and do a "Tim Holtz" type technique and "swooshed" a few ATC cards into the puddle on my craft sheet. 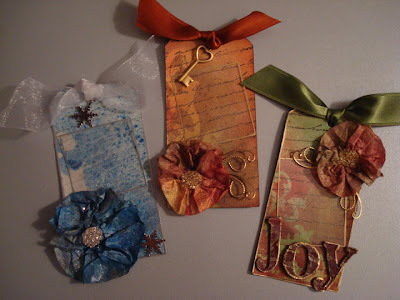 So now I have a few pretty cool backgrounds for ATCs. I just have to figure out what I am going to put onto them. And after that, I did get these two dragonfly ATCs done for my friends that I will surprise them with...unless they come back and see this post! 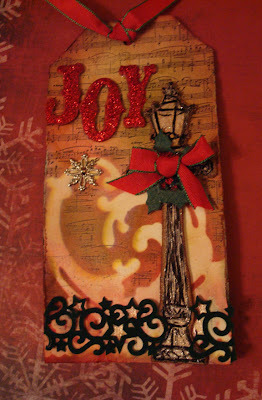 And I am going to send a little something to Joy too for always commenting on my blog. And for Raquel, I gave her a vegetarian lasagna. While I was at the birthday crop yesterday, Raquel picked up Kathryn and took her on a photo shoot at Stanford University. If you have seen my previous attempts at trying to get Kathryn to smile for her school pictures (here and here), then you must know that I am absolutely ECSTATIC that Raquel did such a fabulous job getting pictures of Kathryn...smiling! 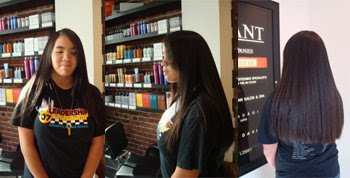 Today was a Drama Queen birthday crop for birthday girls Leilani and Michelle. Michelle loves cupcakes and Leilani loves owls so you can imagine some of the gifts they received. I’ve never seen so many different owls and cupcakes in my life! It was such a fun day! And, I actually cropped instead of just gabbing all day! I made a quick card for Leilani, did a bio page and 10 recipe pages for the swap (which was due today). For my birthday crop, Michelle made me such a fabulous birthday cake. There is no way I could ever make her a cake anywhere near as nice, nor would I want to try! 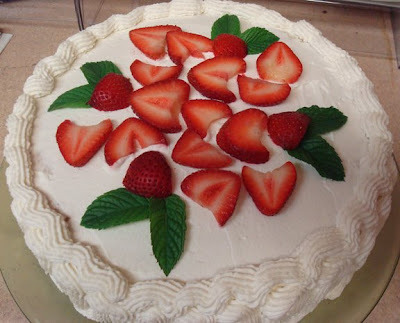 (I was so thankful that Veronica made her a delicious strawberry cake!) So instead, I made a vegetarian lasagna and made Michelle a faux cupcake (which was my birthday card to her). That cupcake was so fun to make and Michelle seemed to enjoy it too. 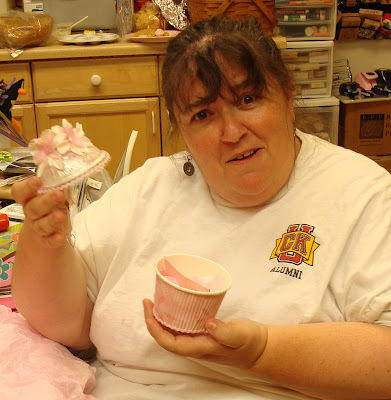 I love this expression on Michelle's face when I told her I made it from a yogurt container. Here's a closer look at the faux cupcake. 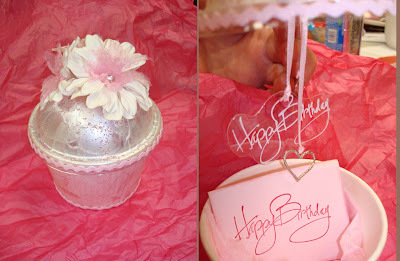 When the lid is lifted, the birthday wishes dangles. The charms are from ACharmingPlace. And here are the goodie bags that Michelle and Leilani gave all of us...including a new stamp that Michelle had signed by Tim Holtz just for her Drama Queens! Since retiring, I have been making dinner nightly, trying to cut-back on fast food and eating out. But today was one of "those days" and I just didn’t want to cook. In fact, I just wanted to have a nice big strawberry margarita! Kathryn went to a Maroon 5 concert with a friend, so it would be just Jose and I for the evening. So when Jose called to say he was on his way home from work, I told him, "We’re going out, and I’m having a margarita!" He laughed and said, "I don’t know what has happened today, but ok!" I’m so glad we went out. It was a night filled with laughter, mostly on my part, and that was before the margarita ever arrived! The reason for the laughter...the realization that "my old man" has developed "old man" tendencies! Repetitive complaining about something that bothers him, and by-golly, he’s gonna tell you about it! What bothered him at the restaurant? The lighting! "It’s so dark in here. This isn’t a romantic french restaurant, it’s The Outback! There should be a little light in here! They could at least have a candle on the table to make a little light." The more I giggled, the more complaints he came up with. He even looked across the way from us and saw an elderly man and commented, "I’ll bet he couldn’t see the menu either! Next time we are going to Denny’s! I can see the menu at Denny’s!" I was giggling at hearing the continuous complaints that he couldn’t read the menu. But I nearly lost it when Jose continued to complain but this time to our waiter! He even suggested a dimmer switch to the waiter! And even asked "don’t you have a flashlight?" By this time, I was no longer giggling, but just outright laughing out loud. I couldn’t believe he was actually complaining to the waiter about the lighting! Thankfully, even the waiter thought it was funny after Jose suggested a flashlight. And I about lost it completely when the waiter produced a key chain flashlight from his pocket and handed it to Jose! It was so ridiculous and hilarious, I had to take a picture of Jose trying to read the menu (and paying the bill) by flashlight. And when I thought it couldn’t get any funnier, Jose looks at me and laughs after I took the picture and said, "And what’s so funny? You know YOU can’t read it either!" BWAAHAHAAHA! It’s true! I couldn’t read it either, but I didn’t complain or ask for a flashlight! I thought I would write a little bit more about my daughter Raquel, especially since Angela told me at Stamp Club that she read my blog and thought I had two children, not three! 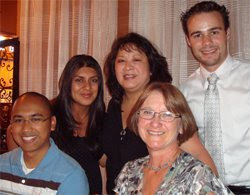 to promote her photography business, Life Stages Photography. She did such an awesome job. This is one of my favorite shots she took. It was exciting to see people lining up to try on the various costumes to get their picture taken. Raquel was so organized for the event. I got these couple of pictures before my battery went dead. Raquel sets up and takes the pictures. Jennifer (Raquel’s childhood friend) shows the customers their pictures, and if they like what they see, Jennifer collects the money. Kathryn did the computer work for the order and prints it out. Kathryn really did a great job too. She was so concentrated on her job and she kept up with the fast pace. What a great event this was. Today was my "retirement" luncheon at A Bellagio and about 20 of my former co-workers and attorneys from those past 23 years were there. Mark (the attorney that both Sue and I worked for before she started her own practice) even drove down from Sacramento to celebrate with us - that was just the sweetest! 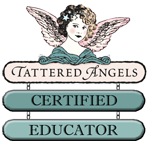 "Christine has been my right-hand man for 23 years and I have needed her! Especially since I’m left-handed AND dyslexic!" "...we’ve been together so long it’s like we’re an old married couple." "I blame the reason for Christine’s early retirement on one thing, and one thing alone! 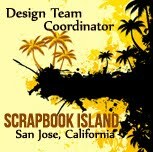 SCRAPBOOKING!!!" I especially loved Sue's personal note to me, which began: "Christine, this is probably your last chance to decipher my handwriting..."
I will definitely miss everyone, but now I will be able to devote more time to the things I REALLY love to do...creating and teaching! 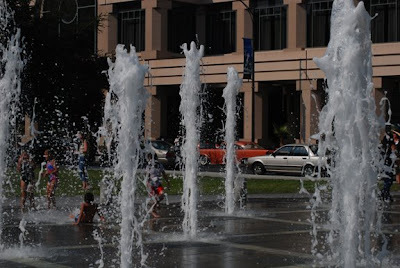 Here's a picture I took on Friday when I went on the "photo walk" in downtown San Jose with Michelle and her husband Dave. Dave graciously let us (well, me lol) follow him around and take pictures, while Michelle asked him what settings we should have our cameras on for the particular situation. I did actually learn something from this process! I am not able to repeat it verbally, but a few more of the knobs on my camera make more sense to me. This setting was for stopping the droplets of water! 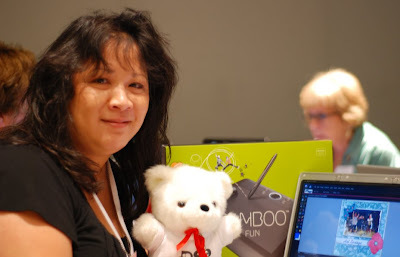 And here's a very tired looking picture of me, the digibear (every time you finish a layout, you ring the bell and get to keep the bear until the next person completes a layout), one of my digital layouts and the Wacom Bamboo Fun tablet that I won. I was operating on about 4 hours of sleep that day, and planned on leaving early, not staying for the entire 9am-9pm crop. And here's Veronica, Michelle and I at the end of the day of the Adobe Digital Crop. Surprisingly, the three of us stayed from start (7:30 for breakfast) to finish! It was a lot of fun! We had a belated birthday crop for me yesterday. The Drama Queens out did themselves, especially Michelle who baked this beautiful cake. It was delicious! Drama Queen Kathie was paying me back for my "tattoo" prank and gave me a lovely birthday card with a very tattoo-faced person on it and brought me a delicious "possom pie" (it was really lemon meringue). Inbetween all the fun, I just about finished my 9 pages for the recipe swap. 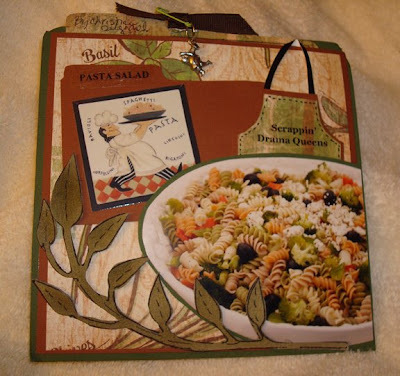 I made a pull-out recipe, a handmade paper apron, and traced a Basic Grey chipboard vine shape onto grungeboard and stamped, inked, bent and outlined it. I was hoping to distract the girls with the pretty embellishments to make up for my "easy" recipe! 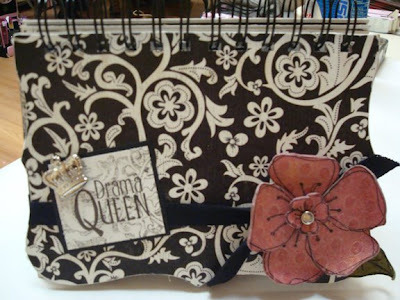 And the night before the crop, I finished up the "Drama Queen" book party favors I had started in Hot Springs. 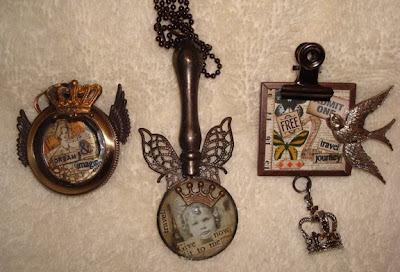 I had fun making the interactive pages, layering charms, hanging pages onto the binding with charm holders (for your cell phone), making the UTEE "Drama Queen" embellishments with the stamp I found in Hot Springs, and making lots of grungeboard flowers! 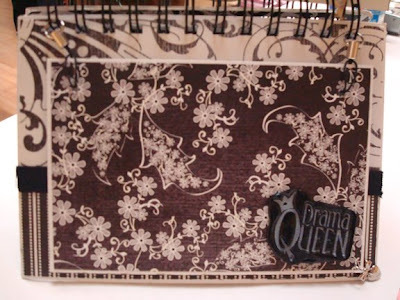 And here's a closer view of the UTEE "Drama Queen" embellishment. I made a bunch of these when we were in Hot Springs. 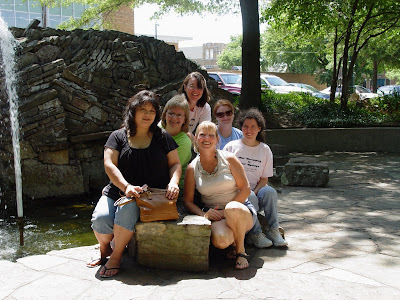 Spent four great days in Hot Springs, Arkansas, scrapbooking with Leah, Joy, Chandra, Sandra and Hayley from ACharmingplace. 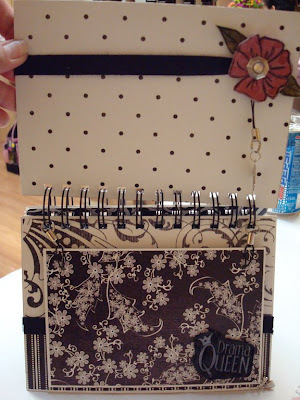 I did manage to actually do a little scrapbooking too. 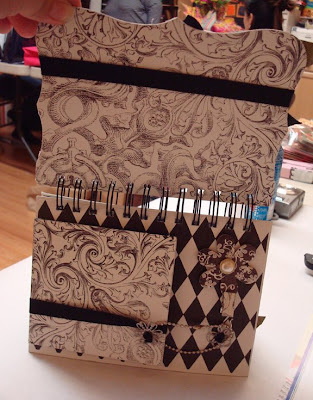 I got started on my pages for Michelle's recipe swap and even finished a few books I will use as party favors for my birthday crop next month. The girls from ACharmingPlace were doing another friendship swap, but this time on ATC cards. I made 22 of them, but unlike my mermaid ATC cards where I used a lot of stamping techniques, this time I decided to make them more scrapbook-like and interactive. Here's one of my favorite ones, simply because it's interactive (one of my favorite things) AND because I recycled the product packing from my Basic Grey Rub-on Roller and used it as the pull-out tag information. Do you see the big pink bling on it? That is where the "hanging hole" was on the packaging. 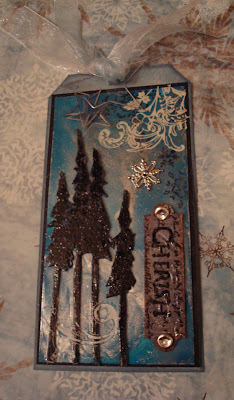 I also used one of Tim Holtz's ATC Stamps and a skeleton grungeboard element on this one. The little flower charms are from ACharmingplace. 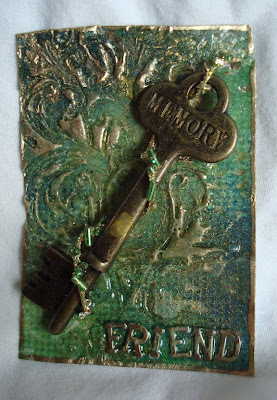 Here's a slideshow of the other ATCs for this swap.